As many of you now by now, I am an Angels fan. I've been a Brandon Wood supporter for a long time now even though his at bats in the majors have been less than inspiring. In fact, his 2010 .146/.174/.208 line still keeps me up at night. And at 26-years-old, I figure this will be the make-or-break season even though I realize a "bust" label is already justified. But with a little disposable income on my hands thanks to the several dollars a month this blog brings in, I figured this was my chance to bet on Wood one last time. 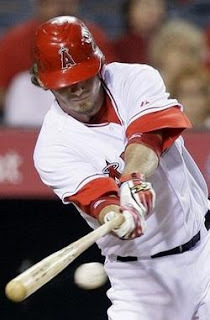 Wood, the 23rd overall pick in 2003, appeared to be the future middle order of the line-up short stop for the Halos. He was ranked as the third best prospect in baseball by Baseball America before the 2006 season after absolutely crushing minor league pitching. He officially stuck with the Angels last season and promptly forgot how to hit that white thing with that piece of wood. I wish I could say that his 2011 Spring Training was showing signs of encouragement but Wood is only hitting .205/.225/.462 in 39 at bats. PECOTA has Wood projected for 21 home runs, 123 strike outs and a .246/.300/.442 line which is starting to look awfully optimistic. So we plan on pretty much using that advertising space on Wood's Baseball-Reference page to make fun of him. Sorry bud, I am rooting for you but this is the Off Base way. Be sure to check out the Brandon Wood page for our jokes until we cross a line and B-R revokes my account. "The only blog that strikes out more than Brandon Wood." Fantastic.